What a joy to celebrate postpartum with this sweet family! Kirsten was fortunate to give birth at home, during the full moon snow storm we had a few weeks back. 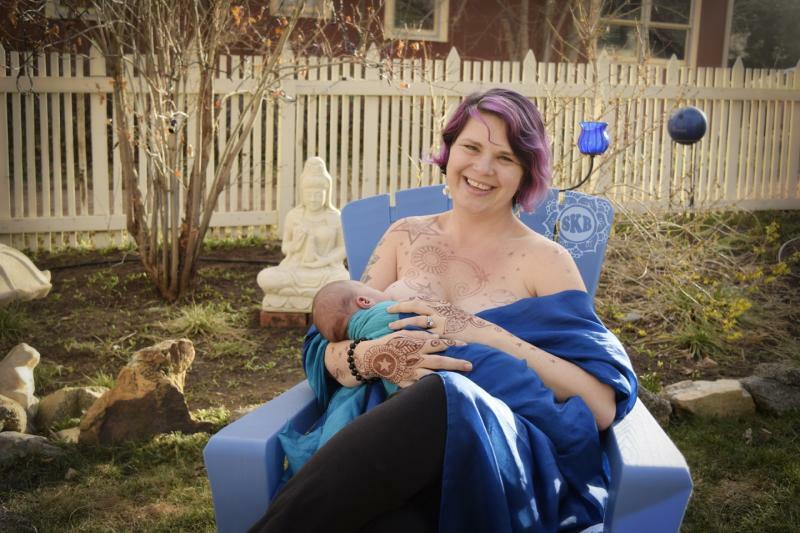 To support her in regaining her strength, I came to her home when her baby boy was just 6 days old, and covered her in the henna symbols she found meaningful. Kristen has an amazing birth story, I'll just share a little bit ~ they had already decided about their son's name before he was born, and Jupiter is his middle name. It just so happens that on the day he was born Juipter comes close enough to earth to be able to be seen with the naked eye, near the full moon. Friends texted her amazing photos of the moon and Jupiter while she labored. So of course, I painted a full moon, Jupiter, and stars. Kirsten's 4 year old daughter suprised her by being able to identify the storm on Jupiter as I painted it... really beautiful! The weather has been swinging back and forth here in Boulder, Colorado, between snow storms and warm winter days ~ these photos were taken on Valentines Day ~ 64F ~ and it was wonderfully warm out doors for mama and baby.